Is there any better time to indulge in a relaxing spa day than while on vacation? St. Simons Island has several spas for you to choose from, all providing exceptional service and ultimate relaxation. The King and Prince Beach & Golf Resort offers the Royal Treatment Cottage, a spa just off the beach, steps from the Atlantic. 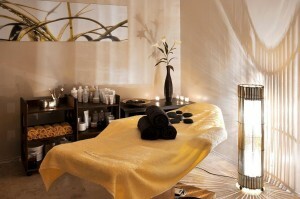 Services offered include several types of massage including Swedish, Aromatherapy, and couples massage. All massage therapists are licensed and highly trained in all the latest forms of massage. The products that the Royal Treatment Cottage uses are all made in the state of Georgia, a fact that the spa is proud of. Additionally, the spa offers products for individual purchase, extending your relaxing spa experience beyond your stay and into everyday life. If you’re searching for a larger and more complete spa experience, Sea Island is what you’re searching for. A Forbes Five-Star Spa and Fitness Center, the spa itself is a 65,000 square foot facility with any service you could imagine – massage, facials, masks, waxing, as well as a full-service salon and fitness center. Packages are available for purchase, as well as child and teen friendly options. Whatever you’re searching for, you’ll find it at the spa at Sea Island. The Island Day Spa is a modern spa that was voted Best Spa on St. Simons in 2010. Traditional spa services are provided by state board certified technicians and professionals; laser treatments, cancer treatment center, and hyperbaric oxygen chamber complete the available services. There are a number of packages available, as well. Complete your vacation with a visit to The Island Day Spa. The Spa at Redfern is located in popular Redfern Village, a live/work/play community that is one of the most popular destinations on St. Simons Island. Relax for a massage, facial, or mani/pedi and then indulge in some shopping – Redfern Village is a one stop shop, and The Spa at Redfern is the perfect complement to that. We take vacations to relax – what better way to indulge than a day at the spa? There is one for every price point and palate on St. Simons Island. Once you are done with your relaxing spot day on St. Simons Island check out some of our recommended shopping excursions here.